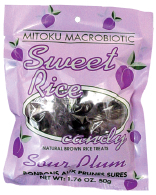 Natural Import Company - Traditional Japanese foods - Mitoku Sour Plum Candy - 1.76 oz. Mitoku Sour Plum Candy - 1.76 oz. Ingredients: traditional rice malt (whole brown rice, sprouted barley, spring water), ume plum concentrate. Sour Plum contains the famous Japanese Ume Plum Concentrate. Excellent for naturally takeing care of that sweet-tooth anytime with a refreshing sour taste. The perfect blend of Sweet & sour-Yummy! Our all-time best selling flavor.